Joe Budden (born August 31, 1980) is an American hip hop recording artist from Jersey City, New Jersey, who, in addition to being a solo artist, is a member of the American hip hop supergroup Slaughterhouse, alongside fellow rappers Royce da 5'9", Joell Ortiz, and Crooked I. His most commercially successful single is the hit song "Pump It Up", from his self-titled album, which contains production from Just Blaze. He was formerly signed to major record label Def Jam, but left for personal reasons and for them pushing back his album releases. After his splitting from Def Jam, he began recording and releasing mixtapes and albums on independent labels. His most recent release being No Love Lost (2013). Budden also co-stars on the VH1 reality show "Love & Hip Hop". Life and Career edit: Early life edit: Joe Budden was born in Harlem, New York. but was raised in Jersey City, New Jersey Uninterested in school, and despite excelling in primary school, he began abusing drugs. After an emotional confrontation with his mother, Budden willingly went into rehab on July 3, 1997. Budden began freestyling, first at his high school with acquaintances against whom he claims that he always won battles. 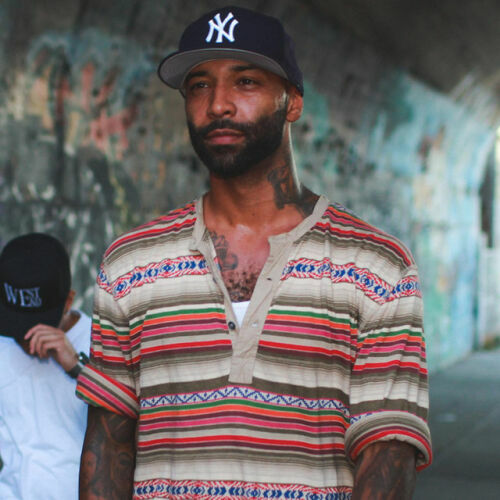 He eventually made appearances on several New York mixtapes with the likes of DJ Clue, DJ Kayslay, and Cutmaster C. 2003-2007: Debut album, Mood Muzik, Release From Def Jam edit: In the year 2003, Budden released his debut solo studio album, Joe Budden. It included Budden's 2003 Grammy-nominated summer hit "Pump It Up", and was also featured in the soundtrack for the movie 2 Fast 2 Furious and the video games Def Jam Vendetta,Def Jam Fight for NY, and Madden NFL 2004. The song "Focus" was also featured in the game and Budden was also a character. Its second single was "Fire" featuring Busta Rhymes, which was in the movie Mean Girls. The song "Drop Drop" was featured on the soundtrack for the movie Cradle 2 the Grave. Budden has hinted in many songs that he was a recovering drug addict and has reaffirmed his position several times through multiple outlets. Budden's sophomore release titled The Growth was hampered due to the label's problems with Budden, which included his Def Jam seniors not agreeing with the direction of his music. The album was not released, and continued disagreements between Budden and Def Jam forced the two sides to part ways. However, Budden managed to release the first and second installments of his Mood Muzik mixtape series while on Def Jam, and the series has been met with critical acclaim. In December 2007, Budden signed a multi-album deal with Amalgam Digital and released his independent debut Padded Room as well as Mood Muzik 3: The Album, Halfway House, and Escape Route. 2008-present: Slaughterhouse and No Love Lost edit: Budden reached out to Crooked I, Royce da 5'9", Joell Ortiz and Nino Bless for a track titled "Slaughterhouse" on one of his Amalgam Digital releases, Halfway House. Based on the reception of the track, they decided to form a group, minus Nino Bless, and named it after the first song they made together. Budden released his second alum titled "Padded Room" on February 24, 2009, and debuted at number 42 on the Billboard 200. The group released numerous songs throughout early 2009, leading up to their self-titled album Slaughterhouse, which was released through E1 on August 11, 2009. The album features production from The Alchemist, DJ Khalil, Mr. Porter, Streetrunner, plus guest appearances from Pharoahe Monch, K. Young, The New Royales, and many others. The group signed with Shady Records on January 12, 2011. In early 2012, Budden and Emanny teamed up with a few producers to form the group SLV (Summer Leather Vest). Budden and Emanny are the only two vocalists. On August 24, 2012, Budden announced he will release a mixtape named "A Loose Quarter" via Twitter. Slaughterhouse released a mixtape titled On The House in promotion for their second album. The group released their second studio album under Shady Records which was titled welcome to: Our House on August 28, 2012, the album debuted on the Billboard 200 at number 2 and number 1 on the Billboard Top Rap Albums selling 52,000 copies its first week. The album features many guest appearances from Eminem, Skylar Grey, Busta Rhymes, Cee Lo Green, Swizz Beats, and B.o.B, and production by Alex da Kid, StreetRunner, No I.D., AraabMuzik, Mr. Porter, and others. On November 9, 2012, DatPiff.com announced that A Loose Quarter will be released on November 23, 2012, at Midnight which was released three days early. The first official single off No Love Lost was "She Don't Put It Down" which features fellow rapper Lil Wayne and singer Tank. The song debuted on the Billboard Hot 100 at #96 returning to the charts since his hit single "Pump It Up" back in 2003. Budden released a remix for She Don't Put It Down which features Tank, Fabolous, and Twista, The music video was released featuring Tank, Fabolous, and Lil Wayne, Twista did not appear in the video. The second single from the album is "N.B.A. (Never Broke Again)" which features Wiz Khalifa and French Montana. Budden released music videos for "She Don't Put It Down" with Tank, Fabolous, and Lil Wayne, "Castles", and N.B.A. (Never Broke Again) with Wiz Khalifa and French Montana The album No Love Lost would debut at #15 on the Billboard 200 selling 30,000 copies its first week. As of March 20, 2013, the album has sold 60,000 copies. The album featured additional guest appearances from Kirko Bangz, Slaughterhouse, Emanny, Juicy J, Lloyd Banks, Omarion among others, production from T-Minus, Boi-1da, Cardiak, Frequency, and many others. Personal life edit: Budden has a son from a previous relationship. In 2010, he was sought by New Jersey police in relation to unpaid child support payments. On March 30, 2012, Budden spent a night in jail and missed a Slaughterhouse concert in his home town over a $75 parking ticket. Budden was for a time addicted to MDMA or "Molly," but has since gotten off the drug and has publicly spoken out against its use.